Hakeem Al-Araibi, the refugee soccer player who is fighting extradition from Thailand, will remain in jail for a another 60 days as he prepares a defense against Bahrain's extradition request. Hakeem Al-Araibi, the refugee soccer player who is fighting extradition from Thailand, will remain in jail for a further 60-days as he prepares a defense against Bahrain's extradition request. Dressed in a brown prison uniform with his bare feet shackled, Al-Araibi appeared at a Bangkok criminal court on Monday to launch a formal challenge against being sent back to a country where he claims he was imprisoned and tortured. "Don't send me to Bahrain," he shouted to reporters as he was led into the courtroom flanked by several guards. Al-Araibi, who fled Bahrain in 2014, was detained and held in Thailand in November at the request of the Bahrain government. The 25-year-old holds refugee status in Australia where he plays for Melbourne soccer club Pascoe Vale, but has been locked in an overcrowded Thai prison cell since his arrest more than two months ago. Al-Araibi's lawyers requested 60 days to prepare the case. They have until April 5 to file the written objection and both sides will present their evidence in court on April 22. Activists campaigning for his release said Al-Araibi should never have been detained in the first place. He was arrested at Bangkok's Suvarnabhumi Airport after Interpol falsely issued a "red notice" -- an international arrest warrant -- which is not supposed to be given to refugees. Outside the courtroom, former national Australian soccer player Francis Awaritefe, who is vice-president the global footballers' union FIFPro, told CNN that "this case is a very simple one." "Hakeem is a refugee. He's a human rights defender. And therefore under international law, he should not be a subject of these proceedings," he said. Rights groups say if Al-Araibi is extradited to Bahrain, he could face an unfair trial, imprisonment and torture. Free speech advocacy group Article 19 released a statement on Monday saying that by proceeding with the extradition request, Thai authorities are "assisting the Bahraini government to extend its attacks on freedom of expression beyond its borders." Former Australia soccer captain Craig Foster, who is leading a global charge to release Al-Araibi, told CNN outside the courtroom that Thailand's Prime Minister Prayut Chan-o-cha has the power to "expel this case immediately." "It's obvious to the world that this is a politically motivated case, this is about retribution from Bahrain to Hakeem who spoke up against the government and others," he said. Foster said he has called on FIFA to discuss the possibility of issuing sporting sanctions against Thailand that could bar international matches from taking place within the country. "If a country can't guarantee the safety of players transiting in and through Thailand in order to play football matches, whether that's Hakeem Al-Araibi or anyone else, then clearly the ability to host matches inside Thailand is compromised," he said. Al-Araibi has been openly critical of the Bahraini government and its record on human rights. In 2012 he was arrested and detained for three months accused of vandalizing a police station during a protest. He told CNN last week that he was released because he presented evidence that he was playing soccer live on TV when the protest happened. In 2014, he was sentenced to ten years in absentia for the vandalism charge. He fled to Australia where he was granted refugee status in 2017. Speaking to CNN from the prison last week, Al-Araibi said that he believes Bahrain has targeted him now because of a 2016 interview he gave to German channel, ARDTV, saying that Asian Football Confederation (AFC) President and Bahraini national, Salman Bin Ebrahim Al Khalifa, was not fit for the presidency of FIFA. According to a report by Human Rights Watch, Al-Araibi accused Salman of failing to stop a crack down on Bahraini athletes during the 2011 Arab Spring protests. "I am afraid to go back to Bahrain," the 25-year-old said. "Please fight for me." Representatives from 13 embassies, including the United States, Australia as well as the European Union attended the hearing on Monday. 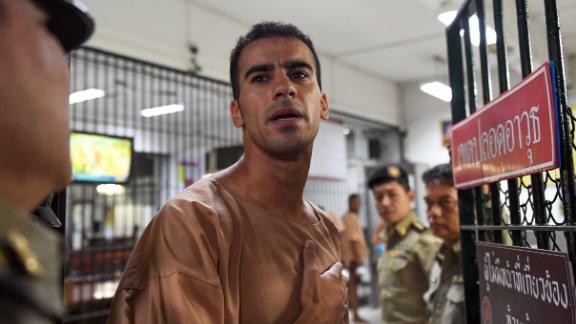 Australia has been vocal in calling for Al-Araibi's release, with Prime Minister Scott Morrison writing a letter to Thai Prime Minister Prayut Chan-o-cha, telling reporters last week that Australia is "pushing on every door" to ensure Thailand releases him, according to SBS news. According to Foster, FIFA has escalated Al-Araibi's case "to immediate high level meetings with both countries." "This is the litmus test," he told CNN last week. "The case that is going to prove whether sport and human rights is substantive, and that the political and huge economic implications coming out of the Middle East region can not play any role in what is a very basic case of a refugee law.